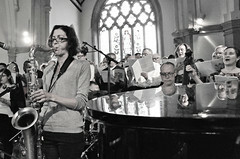 We are recruiting young singers to join the Young Dissenters youth choir for this concert. If you are interested, please contact Harvey Brough using the Contact Form on the right. The Young Dissenters will be meeting in Stoke Newington on Thursdays from 15 September. 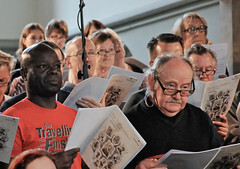 A programme of old and new spirituals, telling the amazing story of the Fisk Jubilee Singers – a choir of emancipated slaves which set out in the 1860s to raise money for their university in Nashville, Tennessee, which was the only American university to admit black students at that time. They toured the United States and Europe and astounded audiences everywhere with the power and beauty of their music, the plantation spirituals and ‘songs of sorrow’ that had never been heard before on a public stage. In London, they performed before Queen Victoria and the Prime Minister and the great and the good of the land to universal acclaim, but they also performed at one of the ‘Ragged Schools’ in Hackney (a series of schools across the country founded for orphaned and poor children), where the pupils were so impressed that they started their own choir to sing the same kind of music. This, as far as anyone can tell, was the first ‘white gospel’ choir anywhere in the world. 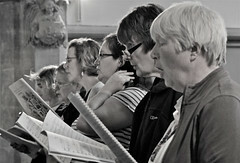 First rehearsal: Tuesday 12 April, sign-up from 7pm for a 7:30pm singing start, St Luke’s church. 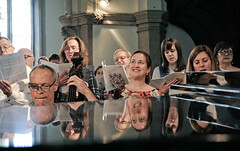 Concert: Sunday 26 June, 7:30pm, St Luke’s church. A Hum about Mine Ears, a composition by Clara Sanabras, conducted by Harvey Brough. First rehearsal: Tuesday 12 January, sign-up from 7pm for a 7:30pm singing start, St Luke’s church. Concert: Sunday 6 March, 18:00 at the Barbican. Vox Holloway will join the Chorus of Dissent and the Britten Sinfonia to present this concert. Based on the Shakespeare’s The Tempest, “A Hum about Mine Ears” is part of Shakespeare400 – a year of celebrations in 2016 to mark the 400th anniversary of Shakespeare’s death, and specifically the Barbican Shakespeare Weekender. Concert tickets are £5 and are available to buy from the Barbican.